We are welcoming any donations of field hockey equipment and gear that individuals or schools/programs have no further use of for here in the States, but still serve a purpose in the hands of young field hockey players half way around the world. Let's help these underprivileged play the game we love!!! Please read the email below that explains the who, what, how and where and know that we are looking to the future of players going to conduct a camp and bring the game we know and love to this underpriveledged world. It is with great joy that I share with you something that has been stirring up in my heart for the past few years, and ask for your partnership in my ongoing efforts. 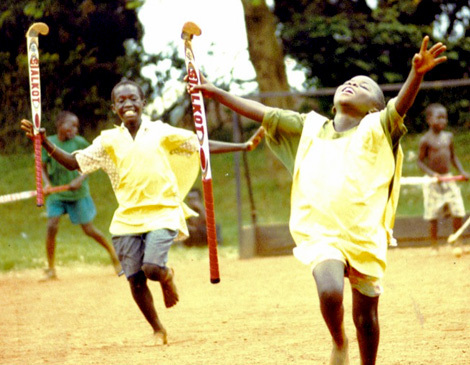 In 2009 I took a trip to Uganda with the intention of bringing hope through sports to a generation of essentially parentless young people that have grown up in the midst of one of the contemporary world’s ugliest genocides, and continue to live in one of the world’s poorest regions. The relationships I built on that first trip have truly transformed my life’s work. 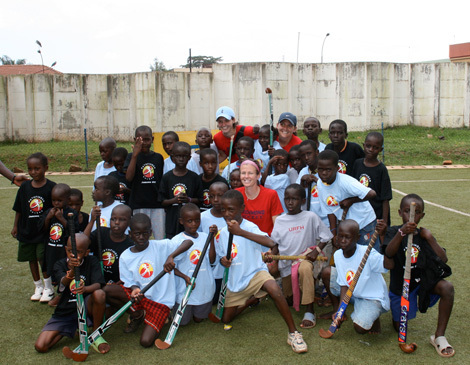 In 2009, as I continued coaching in the U.S., I established a business called Pathfinder Hockey, to partner with an organization in Uganda that promotes field hockey in the capital city of Kampala, and in some rural districts deep in the bush of Uganda. I have now traveled to Uganda three times with small groups, to host camps and clinics, and to distribute gear and uniforms. During my latest trip to Uganda I told friends that I would be back in a few years, with more people and more gear. I am beyond excited to see this coming to fruition as this summer 20 field hockey players and staff are teaming up with about 20 more people coming from Northern Ireland to promote field hockey among the clubs in Kampala, and to teach the sport to local children in Kampala and at the Charlene’s Project schools. We will be on the ground in Uganda for two weeks, but hope our work has an even longer-lasting impact. 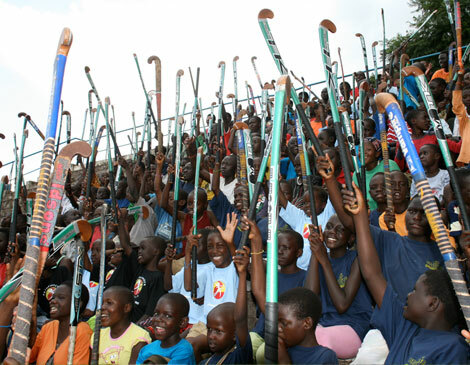 As part of our service to the Ugandans, we plan to distribute new and used equipment, balls, shoes and uniforms to youth clubs and school programs. The Irish contingent of our travel party got its hands on some older uniforms from the Irish National team and club system, which we will distribute to schools in Kampala that don’t have uniforms or even shoes. It is my hope to gather equipment and uniforms from universities and clubs throughout the U.S., to recycle out of our abundance and to promote our sport worldwide. In 2010, while I was still coaching at the University of Richmond, I traveled to Uganda with used uniforms from Richmond and William and Mary in tow. What a pleasure it is to see pictures of these children competing in our old gear as the Spiders and Tribe of Uganda! Attached are some pictures from my last trip so you can get a taste of what this trip means. Truthfully, any amount of donated equipment would be a blessing! Our trip is June 25th - July 12th. I wanted to reach out to you to see what might be the best mechanism to spread the word. Our plan is to ship uniforms and gear slightly in advance of the trip, ideally by June 1st. I am asking for anyone interested to take stock of their storage units and equipment closets in the coming weeks as the season winds down and get in touch with me about the best way to collect or send the gear and old uniforms. A special thanks to Steve Jennings and one of his alumni goalkeepers who recently provided us with her full kit. It is en route to Kampala and will land in very grateful hands! Thank you for reaching out to us. For years we have been doing the same with a program in Paraguay, however have recently lost that connection down their and much to our dismay the project fell apart. We would love to contribute on a continued basis to support your program. I would also be very interested in traveling with you on your next trip as this has been something I had planned to do in both Paraguay and Haiti. We have been working on securing safe accommodations for our players in Haiti which has proved to become a problem. I will gather equipment, old uniforms and whatever else I can get my hands on and then make arrangements to get it to you before June 1. I would love to add a whole section on our website to support this project so anything you can send me that would help would be appreciated. Much thanks and I will be in touch.